Retention is a very important thing to bear in mind if you intend to carry a gun every day, because keeping a pistol safe in it's holster is the first and last order of business. You aren't safe if your firearm is not, so that's why it's good to know a thing or two about holster retention. The basics of retention are fairly simple. A pistol is held in a holster, and the holster is held to the wearer. How that happens depends on the exact nature of the carry system the wearer employs. Two of the most common carry methods are inside the waistband (or IWB) and outside the waistband, or OWB. IWB and OWB holsters dominate the holster market, though shoulder, ankle, pocket and thigh holsters are also quite common. The former two are the easiest and most comfortable to wear, which is largely why they are the most commonly used by those who carry every day. In either case, the principles are more or less the same. A pistol is held in place by the holster, which ideally allows for a minimal amount of vertical or horizontal travel...until it's deliberate. A holster provides the requisite tension by moderate compression and/or with friction from the material itself. Hybrid holsters, such as those made by Alien Gear Holsters, provide both, as such holster employ both a base material, such as leather or other material, and a plastic retention shell. Some have adjustable mounting hardware, which will raise or lower the shell and thus increase or decrease the retention force of the holster, essentially clamping down on the pistol. Then, the holster itself is held in place. With ankle, thigh and shoulder rigs it's different, but OWB and IWB holsters are supported via a belt. IWB holsters tuck behind the waistband, OWB holsters either slip a paddle over the belt/waistband or thread the belt through the holster itself. A belt holds vertically and horizontally, so it shouldn't travel in any direction once cinched to the wearer. The best belts provide more than ample hold, and don't allow any gun sag, where your pants and belt "dip" where the gun is sitting. With your pistol secured by a holster, and your holster secured by a gun belt, neither will move much, if at all, and you can carry securely. You may have found some literature, in a magazine or online, about holster retention levels. You may see holsters marketed as a "Level Two" or "Level Three Holster." According to PoliceOne, the "levels" of retention were created by Bill Rogers, a former police and FBI instructor. There is something to it. The way it works is every holster has a number of retention features. It might be just the holster itself, such as a leather pancake holster or hybrid holster with retention shell. A thumb break or strap is a second feature. A locking system is a third, and so on. 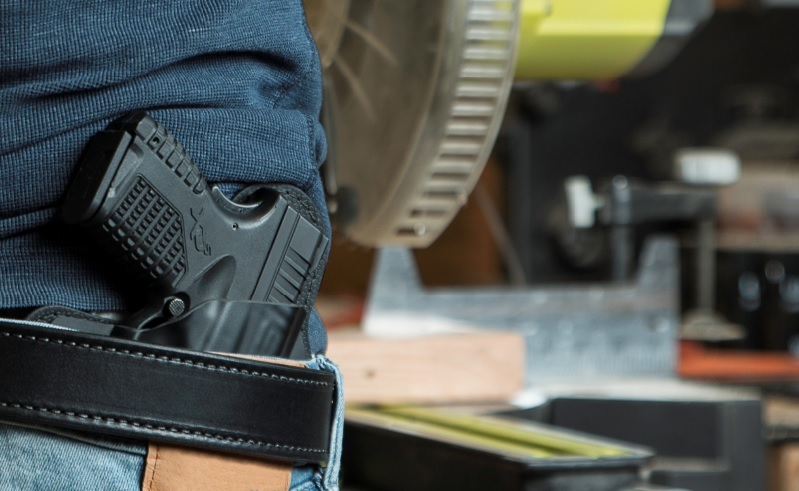 How holsters get rated is by testing whether or not the pistol can be extracted from the holster by a party other than the wearer with five seconds of moderate tugging and pulling. If the gun is kept in the holster with all retention devices engaged for five seconds, that's a Level One, five seconds with one retention feature such as a thumb strap disengaged is a Level Two, and so on. Anything beyond Level Three is probably a bit heavier-duty than what the average Joe Carrier is looking for in every day carry holster. If you're shopping for a concealed or open carry rig, it behooves a person to consider what retention level they're looking for. Opt for a holster where the retention level can be customized to your preference. If you're considering open carry, then you should probably consider getting more retention than someone who is concealing. As open carrying is becoming more widespread, there are starting to be instances of people whose guns are being taken off them, a danger that should be borne in mind. If concealing, that doesn't mean you should skimp either. In any case, waistband carriers should definitely pair any holster with a solid gun belt. That way, the holster sits securely wherever you locate it.